Agilence makes software for retailers. Agilence seems like they have a great product. They focus on retailers and one of the major challenges retailers have today is dealing with all kinds of data. The change in big data in recent years presented two challenges. One is being able to collect data and the other is being able to analyze that data if you can get it. The reason retailers want data is so they can improve their business. It seems like Agilence has a software product that helps retailers collect data and it helps those retailers to analyze the data they do get so they can make improvements and understand what’s going on with the company. There’s a lot more to it than that, but you can review their website for all the details. We’re going to jump over to what they’re doing with their blog and see how Agilence is bringing in potential clients (retailers) with posts. I wanted to point out here that Agilence isn’t just doing a blog. They have an entire collection of resources on their website. They’ve gone full in with content marketing. There is the blog along with FAQs, white papers, press releases and more. It’s pretty impressive to see a company providing all these resources for their potential clients. The goal of content marketing is to build relationships with potential clients. You can do that by providing value to those potential clients. A good way to provide value is to answer questions that the target has and to offer ways to help them with what they’re struggling with. In the B2B world it’s good to focus on how the target is struggling with their job. We’ll get into that more in the next few points, but here is an example of how a blog can accomplish that, but so can other forms of content like white papers, FAQs and more. I really like what Agilence did with this post. I used to work in the catalog industry, which is similar to the retail industry. My boss, the Director of Marketing, always had industry trends on his mind. He was paying attention to trends in the general economy. He was paying attention to style and fashion trends. And he was looking at business trends in the industry. In this post, Agilence is looking at the idea of trends and how retail execs can stay ahead of upcoming trends that will be occurring later this year. That’s something that’s obviously a challenge for these folks and Agilence is providing and answer. That’s how you provide value with a blog post. I also like how they effectively used a list for this post. The list post is a great way to communicate what you want to say to your reader. It breaks up the content. Big blocks of content are kind of scary to readers so breaking things up with segments, sections, headings and lists is a great way to make content look less scary. This post has a lot going for it. We just looked at a list post and how well that format of post can connect with people. This one is a list post as well, but it’s also a how-to post and it’s a part 2 from a previous post. The success of this post is that it’s touching on an important subject for the reader: mobile. Retailers care about mobile and how it will affect their current paradigm. This post doesn’t just state that mobile will change retail. 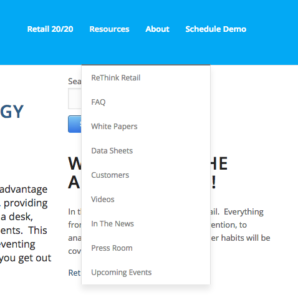 It provides actionable tips for retailers so they can change with the new paradigm and survive. When a post is successful it can be a good idea to create a followup or a part 2. You can often learn from what went well with the first post or learn what could be improved and create another hit post. You know people are interested in the topic so following up on a popular post can work great. And it can save time coming up with ideas for what to write about. The other reason to create a part 2 would be if the scope of a topic is too big. If that’s the case then cutting back and creating multiple posts is a good idea. And you give readers a reason to come back to the blog. You know, a blog post doesn’t always have to be in-depth or complex or all those kinds of things. I like this little post that Agilence did recently. It’s a general update on what’s going on with the industry. They used Spring as a way to say that things are looking good for the retail industry at the moment. They say that things will probably be challenging in the future as always. There are always challenges, but it’s a simple post that provides a little comfort and a little optimism. It’s good to read that from industry experts. One of the first things I look for on a blog is the consistency in the scheduling. Perhaps the biggest challenge with blogging is sticking to a schedule. So often I’ll see a business that gets into blogging full on with five posts right away and then a few more the next week and the next month and then the steam runs out and the blog can of putters along with a post here and there. Maybe that’s one reason that Ghost Blog Writers even exists. It’s challenging to maintain a consistent blogging schedule, but the benefit is that if you can do something consistently you’ll kind of go into automatic mode and before you know it you’ll have this collection built up. It’s kind of like saving money. If you put away $100 a month you’ll get used to it and forget about it and over time you’ll build a good savings. That’s usually a better way to save than putting away $100 here and there when you remember. Agilence has been doing a pretty good job with their schedule, but it looks maybe a little here and there. Sometimes there are two posts back to back and sometimes there’s a month that goes by. To stick with a consistent schedule, separate the brainstorming and writing. Brainstorm 2-3 months of ideas at a time and then schedule time to write the posts each week or each month. Agilence is doing some good things with their blog. They have a clear target reader, retailers, and they’re looking to attract those readers with this blog. I think they do a good job with their topics and they keep the focus on the reader and providing value to that reader. It seems simple, but that’s the way to create a successful business blog.